Which spells to learn as a gnoll? I'm playing a GnSk^Ash and I don't have much experience with spells. Those are the spells I know plus the ones I selected as candidates to learn. Which ones should I learn and which ones can I forget? I have 8 spells of amnesia available. Re: Which spells to learn as a gnoll? Deflect missile is the most interesting of those to me. Blade hands wouldn't be bad as a gnoll, but you can't use it with spectral weapon, and it displaces statue form (That being said, if you are going to use transmutations, swapping for different situations isn't a bad idea) I don't know how much unarmed you have vs. what kind of weapons you have, so it's hard to say which is better. I don't know that ring of fire is all that worthwhile for the passive fire clouds alone, I mean they aren't bad, but unless you are also hurling enhanced firestorms around, it's probably not worth 7 slots. Guardian golem is no longer useful, it's of arguable use in some parts of the mid game, but not at the point you're at. Simulacrum is pretty darn powerful, but death channel is too, so I don't know that I'd sacrifice one for the other, using both isn't bad power wise, but I find simulacrum fairly annoying to use, personally. One thing you could do (if you don't mind the tedium of summoning) is forget Infusion, Song of Slaying and Tukima's Dance (rather bad spells) and get Simulacrum (which is extremely strong). Generally all summoning spells are very strong (except maybe Guardian Golem) but rather tedious to use. 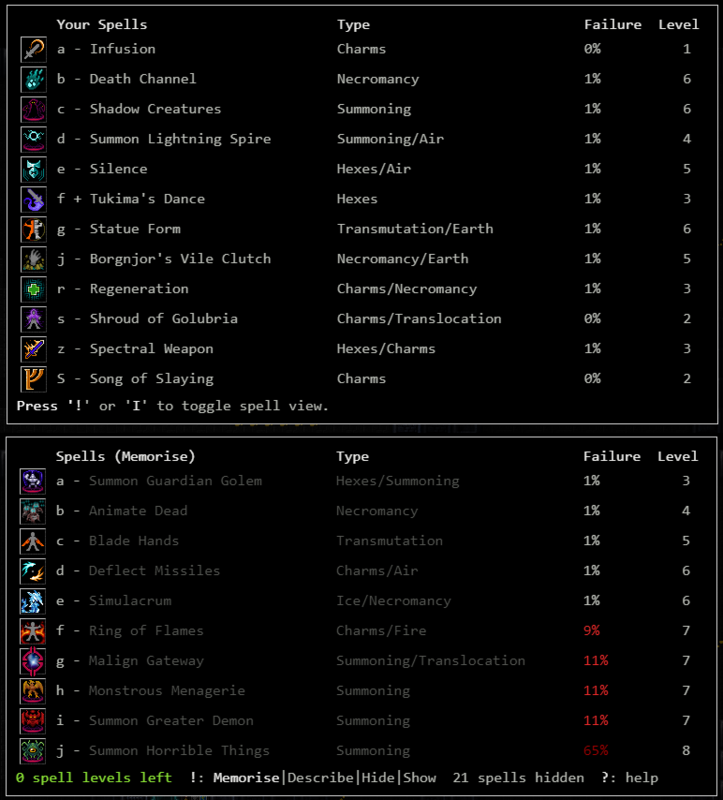 If you don't have much experience with spells then you can take a look at this post : https://crawl.develz.org/tavern/viewtopic.php?f=5&t=23802 which is an experienced player's opinion on each spell. Borgnjor's Vile Clutch is not in it because it was added in 0.21. If you are fine with playing summoning-type characters, both Malign Gateway and Monstrous Menagerie are great. Another option is to only use lower-level spells and wear heavier body armour. Of your current spells, shroud of golubria basically means extra +10 hp, which is not significant at this point in the game. Infusion is also not that useful now. Simulacrum + Death Channel is an awesome combo.